The responsibility of upcoming City Reach in the Phoenix area and the City Reach campaigns in the future have been weighing heavy on me a long time. Three years we have prayed about this and over two years we have actively planned and prepared for taking tent revivals into our cities. I can see the hand of divine providence using situations, experiences and even trials the last many years to equip us for this mission. I believe that God has adjusted us, corrected us, molded us, rebuked us and chastened us in order for us to be ready for such a time as this. City Reach Wichita and City Reach Richton last year both greatly encouraged me that God is in control of all of this. He is teaching me afresh that where His finger points, His hand will make the way. But the last few weeks the burden of City Reach has settled down on me in earnest. I go to bed thinking about the possibilities. I wake up 3-4 hours later thinking about the impossibilities. I pray until my heart is full of the potential and sometimes I am immediately overcome with the insurmountable problems that could arise. I realize that my nervousness, anxieties and concerns for City Reach are no greater than many of you carry daily. You must provide for your family, tend to your children, run your businesses and pay your bills. You face challenges every day and you have to trust God the same as I do. I get that. I sympathize with that. Life is demanding and no one in their right mind would say that it is easy. We all have to deal with life and its demands. City Reach is my vision, my calling, my charge and therefore my duty and obligation to fulfill. I should have no reasonable expectation that anyone else will help bear my responsibilities in addition to their own. Nevertheless, I have been blessed beyond measure that others have caught my vision and are helping to take up my cause. They have helped and are helping carry the load spiritually, emotionally, physically and financially. As I type this, Bro. Jimmie Radcliffe is preparing to leave Oklahoma going toward Arizona with the tent and equipment. He is making a commitment lasting many months because he loves souls and believes in my vision. Churches are praying and churches are giving. Families and individuals are praying and giving. We receive calls and texts everyday with tremendously encouraging words. These facts bring me unspeakable joy. Yet, all the help, all the assistance, all the guidance and all of the reassurance does not lessen the fact that I will answer to God for the work He has called me to do. That is what keeps me up at night. Therefore, I felt like it was imperative that I spend a few days alone with God finding strength and peace and courage and direction that I must have. I needed to get my mind and heart in the right position before the rush of activity begins about midweek in El Mirage. So I followed the advice of our Lord. In a very literal sense, that brings us to Quartzsite, Arizona. Quartzsite is a desert town on the way from LA to Phoenix. It is a small town of less than 4000 people that swells to well over 1 million people in January and February. 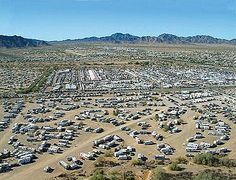 Although there are many RV parks in town and they fill up completely, most people park in RV's all over the federally owned desert land surrounding the town. 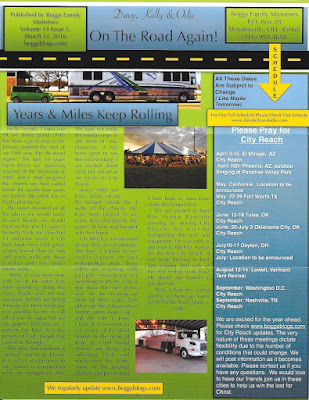 They dry camp without any hookups and they do it in many tens of thousands of RV's from all over the USA and other countries. We came through here in January one year on the way to California and this is a glimpse of what we saw. It goes on for miles all around Quartzsite. With a million+ people here, I really wanted to do a City Reach in Quartzsite during January, but with such a crowd I found it impossible to rent property for the tent. I made many, many inquiries. In the process of that, I had contacted some churches here and I wanted to spend some time this weekend getting to know some of the local folks for a possible return visit in the future. But the main purpose this weekend was to park in the desert out of town and spend some time fasting and praying and preparing ourselves for the challenge ahead. We arrived late Friday evening and it has been a lovely and refreshing few days. I feel charged up and ready to go. Kelly Jo and I love all kinds of places and the desert country has a special place in our hearts. The saguaro cactus, the mountains and the arid climate puts us on a horse back riding through no mans land chasing the wind. Wow! What a gorgeous place! We plan to leave for El Mirage this evening. I will leave you with a few pictures of the last few days. Did you see the face in the clouds? Maybe it is a guppy! Sunday morning as I walked around the car about sunrise I scared a little desert fox and he scared me. He ran to the back of the car and here we are both peeking around to see if the other one is still there. He was a friendly little guy. Sunrise looking toward the east. Yesterday's post was preempted by our traditional Easter poem so I am including the links from last week's posts today. We started the weekend by leaving the Los Angeles area, although we did not leave it very quickly at all. The only real good time to pass through the heart of LA on any interstate is sometime between 11:00 PM and 5:00 AM. 9:15 AM Friday morning did not look too bad on Google maps but I know how fast that can change! We were leaving town completely but I set the Prevost shop in Mira Loma as our first stop just to gauge our progress. Prevost was 75 miles away and 1 hour and 35 minutes with current traffic. There were lots of incident and construction icons but not much red on the route. STOP, STOP, STOP, go, STOP, STOP, go, STOP, go! We drove 90 minutes before we were able to drive 55 MPH for about a minute and then slowed down again. We actually passed the Prevost exit in 2 hours and 25 minutes and I was not too disappointed with that. We did see a few interesting sights as we drove in LA. I wonder what exactly a smell good plumber is supposed to smell like? We also saw this old Pinto station wagon along side the road. After 3+ hours and 100 miles we broke free of the city and into the mountains on Hwy 60. Traffic was still heavy for another 70 miles and we had some more city but this mountain pass was a beautiful break. We absolutely love the scenery in California! By the time we reached the welcome center in Arizona after about 260 miles, we were ZONKED. Thank God He helped us though all of that traffic with no accidents and no major brake jamming incidents but my nerves were shot. We rested a few minutes and then pressed on because we only had about 25-30 miles to go and we wanted to get parked and settled before dark. We parked in the desert north of Quartzsite late Friday evening and enjoyed a completely down day Saturday. KJ and Odie did run into town for a few supplies Saturday but I did not go any where except for a few long walks in the desert. We enjoyed the services here yesterday and I believe we will probably be back here in the future. I plan to tell you more about our purpose for being here tomorrow. Today's post is a special Easter post. We are fully vested in tradition around here and this one dates back to at least 2011 on the blog and mid 1990's in reality. Wiith that in mind we bring you our Easter tradition on Boggsblogs.com. I am posting our annual Easter poem on this beautiful Resurrection Sunday. I hope you enjoy it! May God bless you on this Easter. If you are not a Christian, may you be moved by the fact that Jesus Christ died for you and then got up out of the grave for you as well. Thank God He arose! Take a moment to think about it all. Hey, this is Odie checking in with you again today. I want to start by wishing you a Happy Easter. Thank God for resurrection day! I am thankful that Jesus gave His life for us that we could be saved. But that's not how the story ends... on the third day, He arose. My Savior lives! Today I serve a risen Savior! Not only is He my Savior, but He can be yours too! If you do not have a personal relationship with Jesus, I highly recommend my friend, Jesus! He has changed my life and He is waiting to do the same for you! The Bible says, If we confess our sins He is faithful and just to forgive us our sins and to cleanse us from all unrighteousness. Hallelujah! Jesus gives my life purpose. He is the reason I live. I love the way the song writer Bill Gaither summed it up in "Because He Lives". In my frail human mind I worry, fret and wonder about the future. But I must remember the He lives and He holds my future. Jesus makes life worth living. He lives! I want to close today by wishing my cousin Morgan Rae Evans a happy birthday. I can not believe she is now 13. March 26th 2003, when Morgan was born, she brightened our family's world. Morgan, you are a beautiful young lady. We love you so very much! I pray that you keep your tender heart toward God! Below are a couple pictures of us from Christmas Eve 2015. Thank you for reading today. I hope you have a great holiday weekend. We have spent several days driving and walking in neighborhoods around Los Angeles. I will try to post more about that later. Today's post is about our day with several tens of thousands of our closest friends in downtown LA in what is known as the Fashion District. We had been to downtown and visited this same area way back in 2010. We arrived early last Saturday and found a cheap ($10) parking spot and soon realized it is the same parking lot we parked in on our first visit over 5 years ago. Our first stop was for a 1/4 pound hot dog without the bun. Wow! It was great! There are street vendors all along the way, some in trucks and some in trailers. One of the main companies is called Jesus Hot Dogs. I figure with a name like Jesus Hot Dogs, they are bound to be good for me. Most of the vendors serve hot dogs and tacos or quesadillas. Some have a menu of several items. Everything we ate was good AND it was not very expensive either. We arrived early so it was not crowded at first. It was not long before you could hardly find a place to walk. I was too busy trying to stand up to get a picture after the crowd came. We did find some more food though. After about 3 1/2 hours, Odie's chair was still showing very good battery although it was not full charged. That did not stop it from going dead as we crossed the street! Oops! I think it is time to shop for new batteries! We pushed Odie and the chair inside a little courtyard area and asked the taco shop if we could plug the battery in a while. They were very kind to allow us to do so. The battery is sitting on the floor below. Since they were kind enough to give us some electricity, we bought a few tacos. It was the very least we could do! We had planned some other activities but after charging about 40 minutes, we thought it was best to head back to the Green Machine about 1 mile a way. We almost made it! Here I am pushing her the last block. Kelly Jo and Odie both found some great deals on skirts and other clothing items. Odie said she spent about $75 and she had a pile of stuff! I spent my money on food and socks. Always ask for socks and you are never disappointed. We all wish we had time to go back before we leave the area. A few days ago we passed the 8 year mark of driving the BoggsMobile down the road. We now have 303,899 miles on it. That means we have now driven it 119,420 miles and it seems it has many more to go before it is finished. Last year we posted a few pictures of the day we purchased it. You can see those HERE. Folks often ask us if we like the bus or the fifth wheel better. Although we traveled in fifth wheels for years and we enjoyed it very much, we love the bus much, much better. I really liked hooking up the diesel truck to the fifth wheel and making miles down the road. I do miss that but not near as much as I thought I would. It was a much bigger adjustment from pulling the trailer to driving the bus than I imagined it would be. But after a few thousand miles I was ready to go and never look back. One thing we like better is that it is so much easier for Odie traveling in the bus. She is able to stretch out on her bunk rather that being scrunched up in the truck. That really, really helps her at the end of a long travel day. In fact, a travel day is much like any other day for her and that is a big plus. It is also much easier for quick bathroom stops. It was a 30-40 minute stop sometimes to find a safe place to stop, get Odie out of the truck, get her cramped muscles unfolded, get her in the wheel chair, find an available handicap restroom and then reverse the whole process. All of that was amplified in rain, snow or cold. Now she gets out of her bunk and slides to the restroom whenever she needs to. The bus is so much better for Kelly Jo for many of the same reasons. It is also much easier to stop for a quick overnight stop in the bus. We almost always had to find a campground with the fifth wheel since we needed electricity, but we almost never do in the bus. It is much easier to pull over and sleep a few hours now. I think we are money ahead with this route as well. 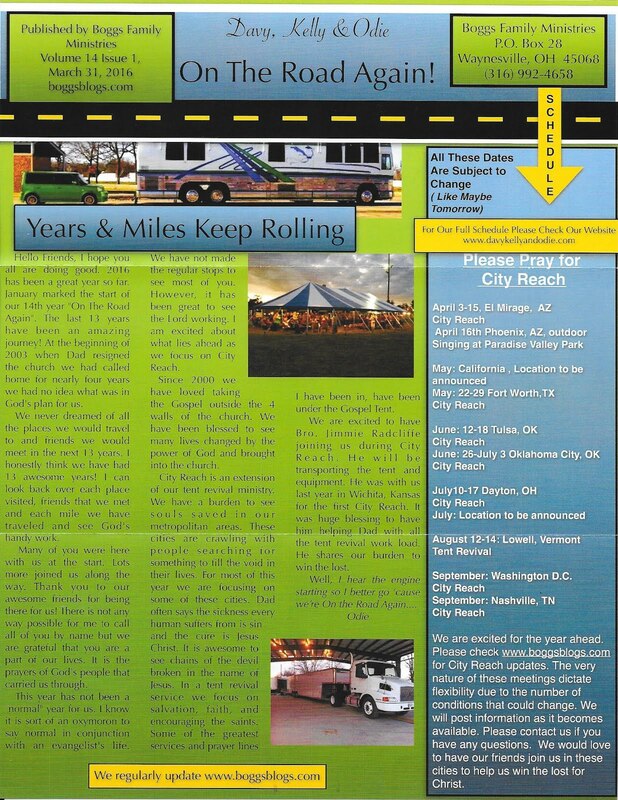 Fifth wheels and other RV's are not made to hold up to the demands that evangelists put them through. We would have been approaching the end of useful life on our NEXT fifth wheel by now and probably our NEXT truck as well. Even though we spent more for this old bus and we spend quite a bit on maintaining it, I still think we are ahead of the game this way. The bus was built to run millions of miles and the Detroit Series 60 engine is known as the "million mile engine." The interior conversion on the bus is much higher quality than most RV's in our price range as well and has proven to hold up better. IF we can avoid a major breakdown, I believe we will stay ahead. I was reminded of one of the best reasons I like the bus a few days ago during a long travel day. Kelly Jo had cooked a pork roast in the crock pot over night. About 30 minutes before we stopped at a rest area, Kelly Jo got up and began to warm it up. By the time I stopped, the meal was hot and ready! Yep! That is what I am talking about! I think we will keep the bus a while longer!